April 20th. See our calendar and details below! First, we are the official on-line informational source for members of the Galveston, Texas area Chapter of SAR. Visitors can access information about local SAR activities and meetings, contact other members, and keep up to date on all chapter events. Second, in keeping with the goals and obectives set out by the National Society, this web site is designed "to perpetuate the memory of those who, by their services or sacrifices during the war of the American Revolution, achieved the Independence of the American People." What is the SAR Organization about? 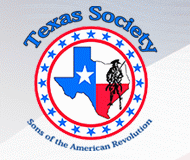 The Bernardo de Galvez Chapter of the Sons of the American Revolution meets the third Saturday of every month, except December, corresponding to the anniversary of our founding in 1896. Guests are welcome. Please join us. Membership meetings are held at Landry's Seafood House located at 5310 Seawall Blvd. Galveston, TX 77551. We meet at noon. From the Mainland, take Broadway to 53rd St, turning right, just before the McDonalds, proceeding to the Seawall where you take a right for a short distance. The parking lot is between the Seafood House and the Hotel. Please contact Vice President Larry Tidwell or 713-408-2679 if you plan on attending, or for more information.